Mumbai: The December quarter may turn out to be yet another forgettable one for Indian investors as commodity downturn, liquidity crunch and declining government spending combine to depress earnings growth. According to analysts, growth in the October-December quarter, or Q3, is likely to be tepid overall, though a weaker rupee and softer commodity prices could help some sectors. Oil and gas companies are expected to suffer inventory losses, while banks gain from lower provisions. “We are expecting a relatively tepid quarter in Q3, exacerbated by oil marketing companies’ (OMCs) inventory losses and weakness in auto sales data," said Gautam Duggad, head of research, institutional equities, at Motilal Oswal Securities Ltd. “We are building in 13% sales and 8% profit growth for Nifty. For Sensex, we are building in 14% and 23% sales and profit growth. Difference in Nifty and Sensex profit growth is owing to OMCs’ presence in Nifty." Global cyclicals such as metals and oil and gas—the drivers of earnings growth over the last few quarters—are looking jaded, given the correction in commodity prices, the brokerage has said. In the three months ended 31 December, crude prices fell 35%. Concern over the recent decline in commodity prices—which rose 12.86% from January till October, but fell 18.47% overall in 2018—found reflection elsewhere too. 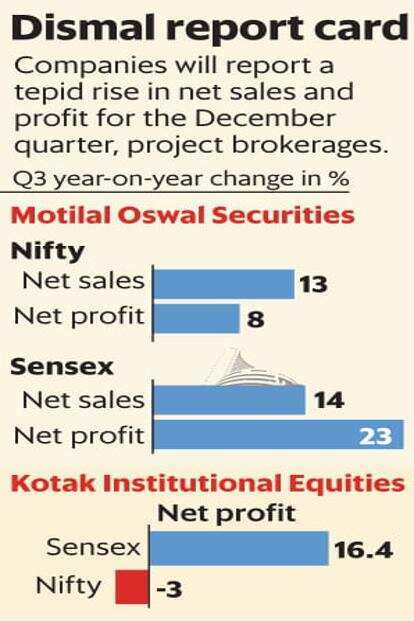 Kotak Institutional Equities expects profit of Sensex companies to rise 16% during the quarter while that of Nifty companies to decline 3%, with the difference largely due to the presence of downstream oil companies in the Nifty index but not in the BSE index. However, falling crude prices are seen to benefit sectors such as aviation and paint, which gain from cheaper raw material. “With regards to crude, while some benefits may be accrued this quarter and higher impact of it will be felt in the fourth quarter. Airlines and some of the consumer discretionary companies such as paints should be big gainers," said Gautam Shroff, head of sales for institutional trading at Edelweiss Securities Ltd.
Shroff expects Q3 growth to be tepid, with annual profit of the brokerage house’s coverage universe declining 1% and remaining flat, excluding commodities and corporate banks. “This weakness is attributable to the fading low-base tailwind, liquidity tightness and slowdown in government capex. For Nifty, we estimate 3% profit growth in the quarter and is prone to significant downgrades," he added. Others agree. Vinod Karki, vice president (strategy) at ICICI Securities Ltd, said the impact of crude and rupee would be visible over the coming quarters as it would be positive for companies with crude derivatives and imports as raw material such as paints and airlines. “However, a stronger local currency will act as a headwind for export-oriented sectors," he added. The rupee weakened the most among Asian currencies in eight years, down 8.46% in 2018, hitting a record low of 74.48 against the greenback on 11 October. A weak rupee typically helps export-oriented sectors such as technology and pharmaceuticals. Financials are expected to drive third quarter earnings, with corporate banks leading from the front. State-run banks are also likely to deliver a better performance, aided by treasury marked-to-market gains and improving asset quality trends, say analysts. “The banking sector will be a key sector to watch as it should see healthy credit growth and solid treasury gains. While banks will see solid treasury gains, OMCs will witness huge inventory losses, which will pull down the earnings growth. On the back of poor performance of OMCs, Nifty 50 companies’ earnings growth is likely to be around 5%, while excluding OMCs, the earnings growth is likely to be around 17%," said Naveen Kulkarni, head of research at Reliance Securities. According to him, key factors to watch will be credit growth, slippages and commentary on pricing power in the banking sector. Demand scenario for FMCG firms and the impact of pricing actions they initiated would also be closely watched, he added. Earnings revival is critical for the markets at this juncture as equities are likely to be volatile due to political uncertainty, the NBFC crisis and fluctuating forex. However, analysts said FY20 will remain challenging from an earnings growth perspective.